Our planning application for 30 homes at 100-102 Prestbury Road, Cheltenham, went to planning committee on 19 October 2017 and the committee members agreed to approve the application subject to the signing of a Section 106. Read more about our plans below. The site covers an area of approximately 1.97 acres and is adjacent to Marchants Coaches depot, NGB Builders and Prestbury Cars of Cheltenham. Number 100 is owned and occupied by Yeates Garage Ltd and part of the warehouse is used as a workshop and store for the repair and storage of vehicles with ancillary office for admin staff. Due to the dilapidation of the premises they are no longer fit for purpose. Number 102 is owned by Barnwood Shop Fitters who relocated their business some time ago, the building is also dilapidated and not fit for purpose. Alternative uses for the site have been considered, such as commercial and retail, due to the dilapidation of the existing buildings and the surrounding area being predominantly residential it is felt that a residential scheme is the most suitable. 30 homes are proposed on the site which will consist of 1, 2, 3 and 4 bedroom homes. The houses will be a mix of 2 and 21/2 storey. 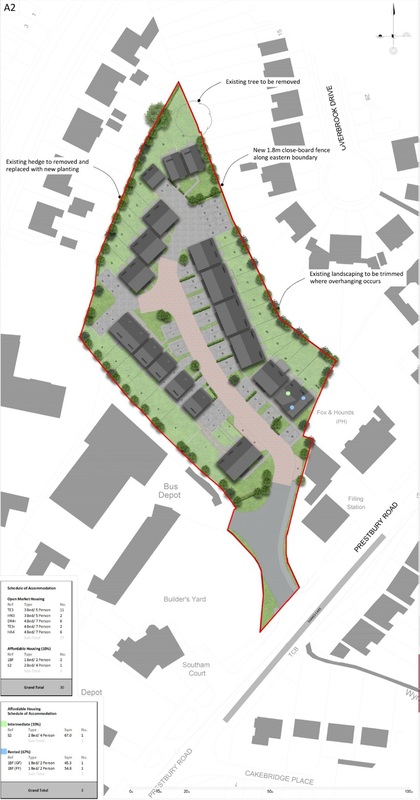 The site has been designed as inward facing to create a private and safe environment whilst respecting separation distances from existing residential dwellings, as well as responding to the scale of the existing surrounding houses. The development will be very private and will have a distinct character. All homes will have either on plot parking or parking very close to their house. An application has previously been made by the current owners to improve the access to the site. This has been approved and will be implemented as part of this development. The regeneration of this brownfield site will improve landscape and ecological benefits, as at present any vegetation is overgrown with weeds and brambles. The creation of front and rear gardens gives opportunity for the new tree and shrub planting. Newland Homes prides itself on quality, with well considered design, creating homes that sit comfortably amongst the surrounding residential area.